On November 22nd, 2013, the fiftieth anniversary of his death, C.S. 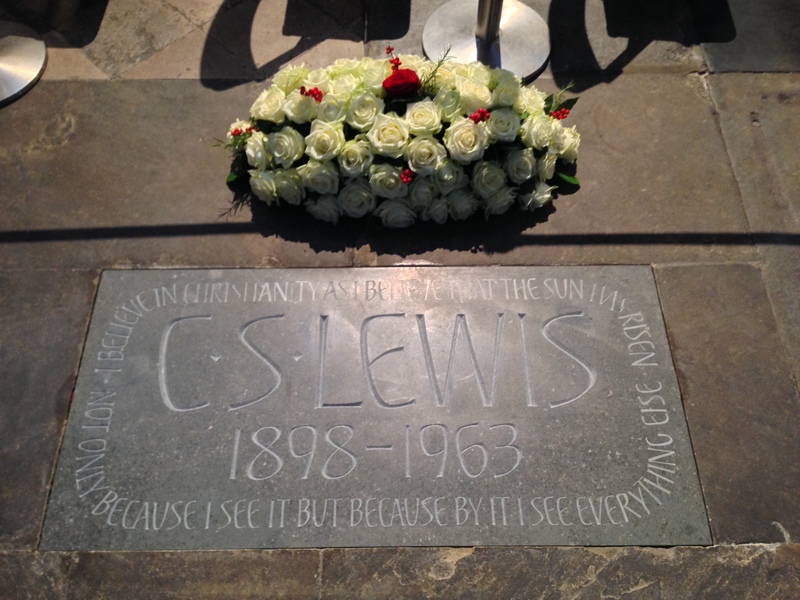 Lewis was honored with a memorial in the celebrated Poets’ Corner of Westminster Abbey. I had the privilege of being present – knowing that this Memorial and its attendant Symposium were events of international, and lasting, significance for Lewis studies, English letters, and Christian apologetics. The Poets’ Corner Memorial was a labor of love by Dr Michael Ward, whose idea this was and who led the effort from the beginning, including being in charge of the fundraising: every penny of the £20,000 required for the Memorial and Service was raised through private donations – and every individual and institution who donated, no matter how big or small the amount, is listed in the records of the Oxford C.S. Lewis Society, archived in the Bodleian Library, Oxford, so that future Lewis scholars will be able to see the global reach and depth of Lewis’s readership. Dr Ward attended to every last detail to the final minute; he joined with many others in doing their part to make this Service something that would truly honor this great man, C.S. Lewis. A proud moment for HBU! Fortunately, I can now share photos, audio recordings, text, and even a bit of video for those who couldn’t be there in person – read on! After the lectures and a service of Evensong at Westminster Abbey, we reconvened to hear a panel discussion on “What Can 21st Century Apologetics Learn from C.S. Lewis”, chaired by Dr Michael Ward. The panel included novelist Jeanette Sears, theologian Judith Wolfe, and apologists William Lane Craig, Peter S. Williams, and Michael Ramsden. There will never be another event like this one – at which were gathered many of the few still living who knew C.S. Lewis personally. 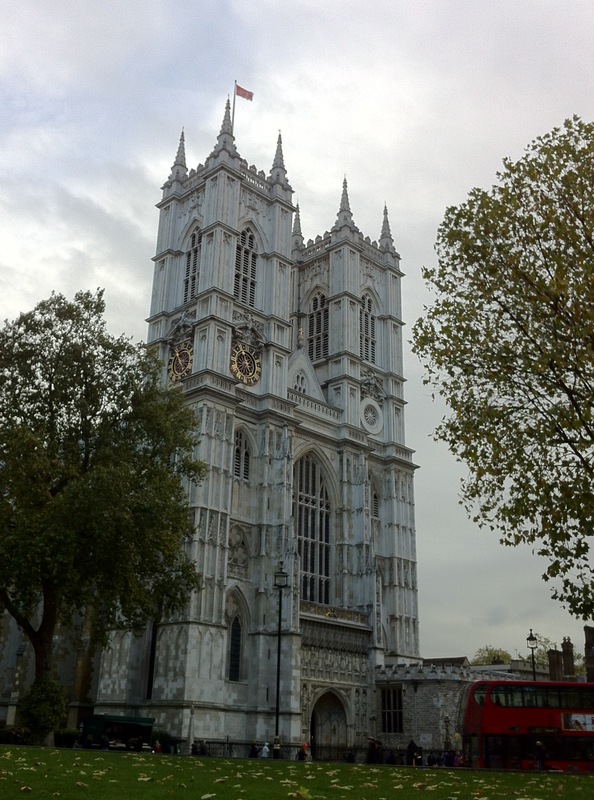 The British people welcomed Lewis as one of their own, at last – though Lewis is popular in America and indeed around the world, it was most fitting that this great event in his honor was conceived of and organized by British people, and held in Westminster Abbey, the coronation church of England. Every aspect of Lewis’s life and work was honored in some way, in the choice of readings and indeed the choice of readers, in the music, the hymns, the quotes selected for the Order of Service. The sermon was given by the former Archbishop of Canterbury, the Right Reverend Rowan Williams – a brilliant exposition of Lewis’s exposition of the significance of language, and the corruption of language. The Service was also the world premiere of a new choral anthem, composed especially for the Service by noted composer Paul Mealor, who composed the motet for the Royal Wedding. The text is Lewis’s poem “Love’s as warm as tears” – and it was stunning. It seems certain that this will be a permanent contribution to the English choral repertoire. Continuing Lewis’s legacy: the closing collection at the Service goes to support a C.S. Lewis scholarship in Medieval and Renaissance Literature at Cambridge University. You can hear the whole of the Service here (scroll down for the audio player), and follow along in the Order of Service here. Fittingly, Dr Ward unveiled the Memorial stone itself, at the climax of the Service; Walter Hooper, who has done more than anyone else over the past 50 years to preserve and tend Lewis’s literary legacy, placed flowers on the Stone. Here is a short video recording of the unveiling, including Douglas Gresham (Lewis’ stepson) reading from The Last Battle, and Walter Hooper placing flowers on the Memorial. In the flower bouquet there are 64 white roses (one for each year of Lewis’s life); 7 sprigs of holly berries (one for each Narnia book); 3 sprigs of rosemary (one for each of the Ransom trilogy); and a single red rose (for the great medieval poem, the Romance of the Rose). Of the countless fine phrases that Lewis spoke and wrote, this one has been chosen as the inscription on his memorial in Poets’ Corner. It links together many areas of his life and work. The sentence comes from an address entitled ‘Is Theology Poetry?’ The answer Lewis gives to his own question is that although Christian theology is not merely poetry it is still poetic and therefore must be received with an imaginative, as well as a rational, embrace. Millions of readers who have moved about the worlds of Narnia, Perelandra, and Glome know the ripe fruits of his imaginative engagement with theological themes and the power of his poetic prose. The address was one of many he gave to the Socratic Club, the forum for debate between Christians and non-Christians, of which he was President. Thus the inscription points to his role as an apologist who publicly—and not without professional cost—defended the faith, ‘following the argument,’ as Socrates said, ‘wherever it should lead’. Lewis was a rationalist as well as a romantic. The sentence is straightforwardly confessional, marking the centrality of his faith at a personal level. ‘I never knew a man more thoroughly converted,’ remembers Walter Hooper, to whom thanks are especially due at this anniversary time for doing so much over the last half century to keep Lewis’s memory green. The Sun is there, aptly enough, for ‘the heavens are telling the glory of God’, in the words of the psalm that Lewis regarded as the psalter’s greatest lyric. ‘Everything else’ is there too, because his vision was all- embracing. Angels, poached eggs, mice and their tails, Golders Green, birdsong, buses, Balder, the great nebula in Andromeda: all are there and all may be redeemed for us in Christ—as long as the Cross comes before the Crown. That Lewis spoke these words at a debating society in Oxford reminds us also of his long association with that university and of his distinguished academic career. If Oxford could have been picked up and deposited in his native County Down, he said, it would have realised his idea of heaven. He lived in Oxford all his adult life—even while happily employed as a professor at Cambridge—and died there three years after his beloved wife, Joy, at his home, The Kilns, on this day in 1963. The 22nd November is the feast of St Cecilia, patron saint of music and musicians. Lewis’s great comedic character, Screwtape, despises music as a direct insult to the realism, dignity, and austerity of Hell. Lewis himself believed its joy to be the serious business of Heaven. He had, in the words of Donne, ‘tuned his instrument’ at Heaven’s door and knew with greater intensity than most the longing to cross the threshold and join the heavenly harmony. Fifty years ago, the door on which he had been knocking all his life opened at last. ‘Nothing makes a man so noticeable as vanishing!’ Lewis once observed, but he had not envisioned how true this would be in his own case. In conversation with Walter Hooper, he predicted that sales of his works would decline steeply after his death. Hooper countered, ‘No, they won’t. And you know why? Your books are too good, and people are not that stupid.’ It was one of the rare occasions when Lewis’s foresight failed him. Hence, it may be safely assumed that he would find today’s service completely surprising, but also—it may be hoped—not wholly displeasing. Come, let us worship God, wonderful in his saints! Splendid account, Holly! Thank you for providing such a richness of order and detail. Well done!